I love experimenting with different flavors of macaroni and cheese. This was such a different combination and it was really good. 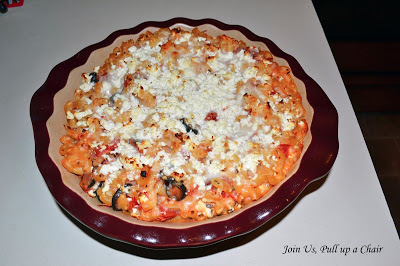 I love the addition of feta and the crunchy feta on top…YUM! I now need to find a recipe for broiled feta. This would be great served with grilled chicken breast or with a small green salad. Think outside the box and try something different! Preheat oven to 400 degrees. Coat a 9 inch deep dish pie dish with cooking spray and set aside. In a small bowl, mix together the tomatoes, olives, 1 Tbsp basil and dried oregano. Set aside. Cook the pasta to al dente according to the directions of the package. Drain the pasta well and return to the pot. While the pasta is cooking, melt the butter with the olive oil in a medium saucepan over medium heat.Add the onion and saute until soft and golden about 3 to 4 minutes, add the garlic when the onions are almost done. Whisk in the flour and cook stirring constantly for 1 minutes. While whisking, slowly pour in the milk to make a rue. Bring the mixture just to boil and continue stirring constantly. Once the mixture reaches a boil, reduce heat to medium-low and simmer. The mixture will get thick and you will need to continuously stir. Remove the pan from the heat and stir in 2 oz of feta cheese and the mozzarella cheese. Season with salt and pepper to taste. Pour the tomato olive mixture over the pasta and stir to toss. Pour the cheese sauce over the pasta and toss to coat. Pour the pasta and sauce into the prepared baking dish. Sprinkle the top of the pasta with the remaining 4 oz of feta. Bake for 20 to 25 minutes or until the edges are bubbling and the top is golden brown. Let sit for 5 minutes before serving.